By now, you may have heard the news that Google has released documentation on how to install their in-development operating system Fuchsia on the Pixelbook. Before we delve into the dirty bits around this news, lets back up a bit and look at what Fuchsia is, what it isn’t and what it could be. First and foremost, Fuchsia is an operating system created by Google and open-sourced for the developer community to help build, test and evolve. It is built off of the Zircon (formerly Magenta) microkernel and is completely separate from the Linux kernels that are the foundation of Android and Chrome OS. For more on the basics of Fuchsia, check out Robby’s article that offers some perspective on the still-mysterious OS. Fuchsia is an early-stage experimental project. We, you know, we actually have lots of cool early projects at Google. I think what’s interesting here is its open source, so people can see it and comment on it. Like lots of early-stage projects, it’s gonna probably pivot and morph. From this, I deduced two possible scenarios for Fuchsia’s direction. One, Google has a very distinct intention for Fuchsia and that intention is a guarded secret that will remain as such until they’re ready to reveal it. With the arguably premature announcement of Android on Chrome OS, perhaps they want Fuchsia to be a viable, tangible OS before it debuts. Two, and my personal belief, Google hasn’t a clue what Fuchsia will evolve into and they are developing it as a future OS with the desire to stay ahead of the technological curve. Some would call it future-proofing which is what tech companies do if they’re smart. What Fuchsia IS NOT is vaporware. Yeah, I’m looking at you Andromeda. Unlike the elusive Android/Chrome OS killer that never was, Fuchsia has not only a dedicated repository but also confirmation from Google devs that it is a project they are committed to dedicating resources. [Fuchsia] isn’t a toy thing, it’s not a 20% project, it’s not a dumping ground of a dead thing that we don’t care about anymore. Take that however you wish but clearly, there are those who believe in seeing the Fuchsia project through to completion. You can take a look at Fuchsia’s brief history and see it is very much tied to embedded systems which lean more towards wearables, mobile devices and IoT but that doesn’t mean it couldn’t potentially be a full-fledged desktop OS. The application of that idea has yet to be seen but the possibility is there. All of this still brings us to a very inconclusive end to Fuchsia’s purpose and ultimate use-case. The theories run the spectrum but the simple fact remains; Fuchsia is very much an experimental OS with years of development ahead of it before it could plausibly be market-ready. Even now, deploying Fuchsia on a device requires two machines, a host, and a target device. The USB boot process not only requires developer mode on Chrome OS but is also “destructive” to the USB device used in the process according to the how-to commit. If that doesn’t sound like a work in progress, I don’t know what does. So much as it means for the Chrome OS/Android project, let’s just quell the rumors with some logical thought. Google has exhausted unimaginable time and resources in making Chrome OS a mainstream platform and has gone so far as to create the flagship Pixelbook to carry the said torch. It is beyond my ability to accept that Google produced the Pixelbook and is continuing to meld the Chrome OS and Android ecosystems while planning its ultimate demise with a completely different OS. Then again, I’ve been wrong once or twice and hey, it is Google. Back to the matter at hand. Fuchsia has been around for well over a year now and there are a couple of devices listed in the Git with which developers can deploy and run the OS. Until recently, the Acer Switch Alpha 12 and the Intel NUC were the only two “officially” supported devices. Now we have seen the addition of Google’s Pixelbook to that list and this began the landslide of speculations from anyone with a thought on the matter. I, however, am looking at this from a slightly different perspective and my opinion points back to our past theories surrounding Google’s flagship Chromebook. I truly believe that Google is doing their best to bring Chrome OS in-house as much as possible. Yes, containers on Chrome OS are still a thing and still being actively worked on by developers. We’ve also seen signs of more powerful Chromebooks popping up in Mountain View that lends a lot of weight to the argument that Google is trying to live inside their own environment. 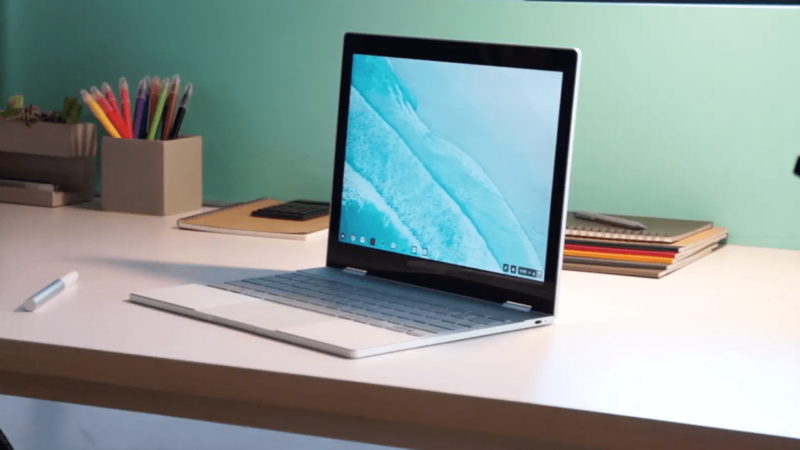 If Google is looking to create a more Chrome OS-centric atmosphere, it makes sense that they would want the Pixelbook to be as versatile as possible in order to adopt the device internally. That means using it as a developer device. To presume the news of Fuchsia on the Pixelbook is anything more than Google embracing their own hardware is a pretty big leap of faith that I, personally, am not going to take. Instead, I would say that Google is taking a step towards Chrome OS becoming a native developer’s OS. Again, this is my opinion based on the evidence in front of me. I’d love to hear your thought especially since many of you are way more well-versed on the programming language surround Fuchsia. If you’d like to learn more about Google’s project, you can do so at the Fuchsia repository here. I’ll be digging through the commits in my spare time in the hopes of learning more about Fuchsia and its potential uses.